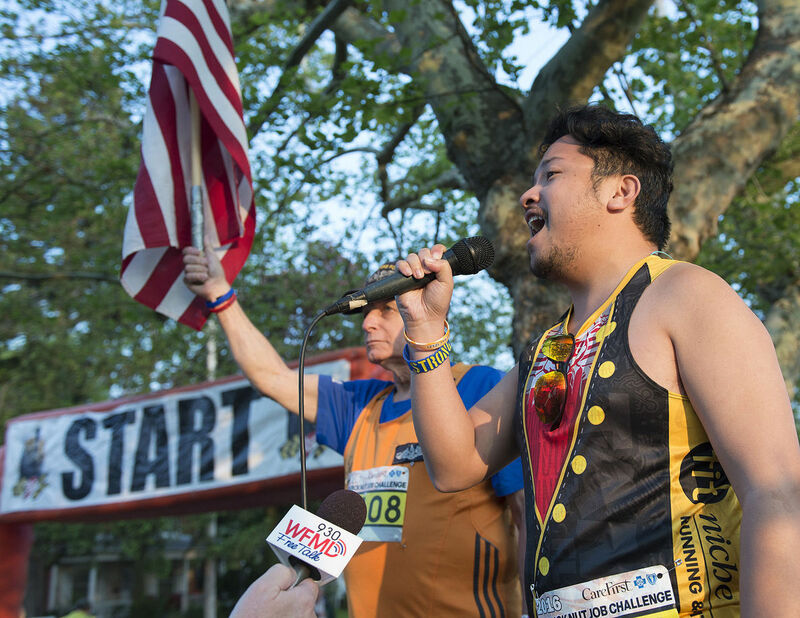 I decided to make a return trip down to Maryland despite having already run here in November 2014 at the Annapolis Running Classic, so this trip was to also check off another state for national anthems, as I was able to get in touch with the communications director for the race, who was excited to bring me on board to sing the anthem for this year’s half marathon and 5k races. 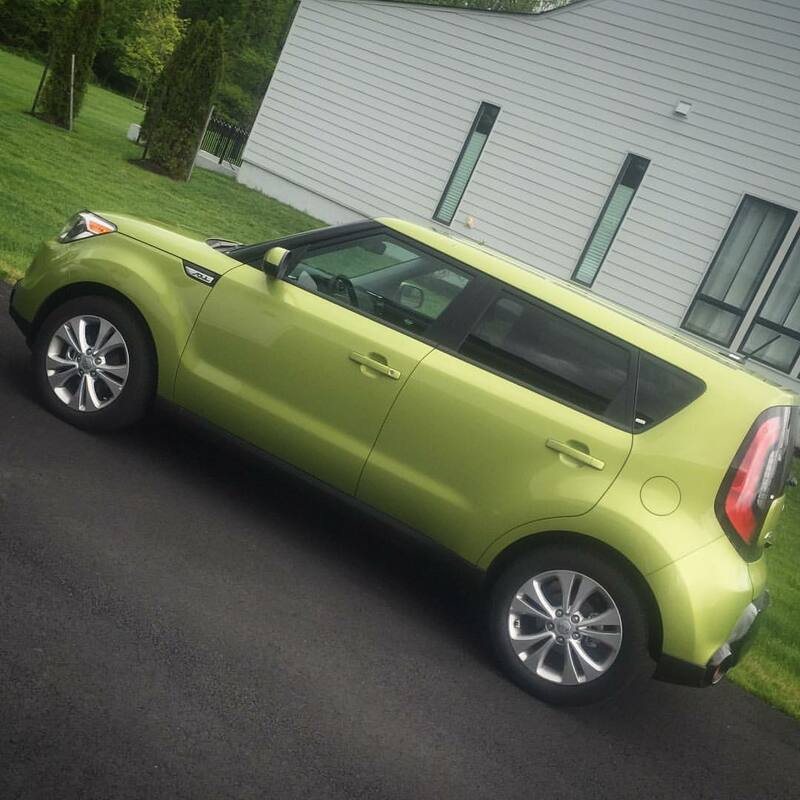 My “jalapeño" for the weekend. 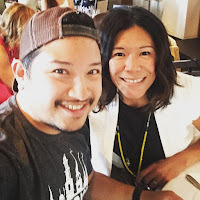 For the weekend, I was going to stay with a family friend - in fact, my godsister – and alum of my high school, Dina, and her family, who lived in a gorgeous modern home in Ashburn, Virginia, about 25 minutes away. So modern and so new was the area they lived in that GoogleMaps didn’t even register the location, and satellite images didn’t show several of the homes that were finished within the last year. After customary hugs – the last time I saw Dina was during Ragnar DC, when both of our teams just happened to be neck-and-neck for most of the weekend, and before that it had been decades – I had some delicious pansit bihon that was prepared by Dina’s kids’ yaya, and then Dina, her older son Nicholas, and I, made the roughly 1 hour drive up to Frederick to retrieve our bibs and then run the evening 5K. 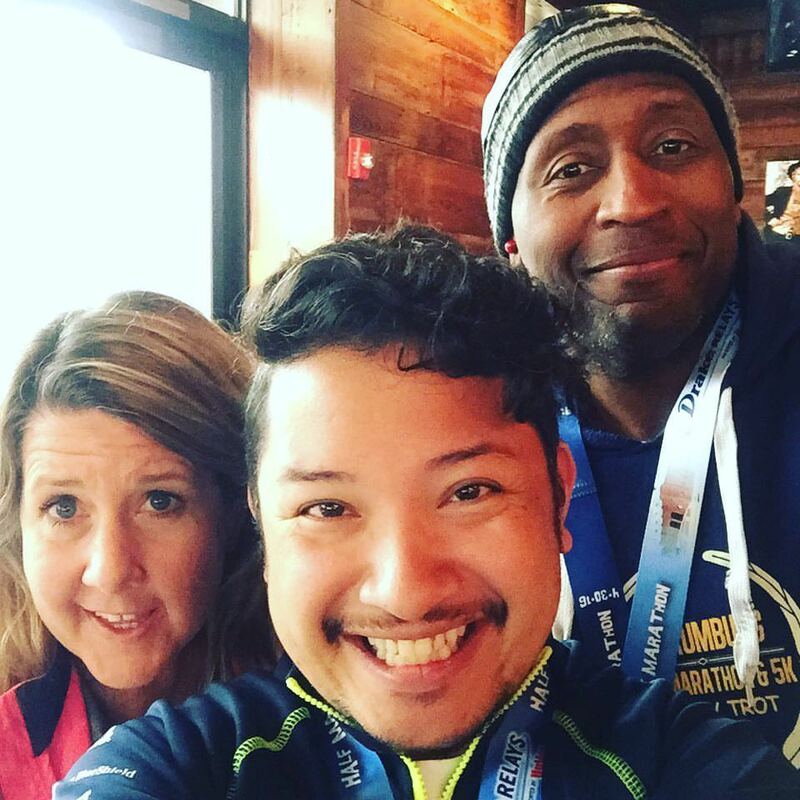 The 5K run was highly attended, and while at bib pickup, I ran into some friends as well as some folks who had recognized me from my Instagram posts and posts in running Facebook groups. I met up with Dave, the race’s communications director, and set myself up at the startline to sing the national anthem on the stage of the Frederick Fairgrounds. After the anthem, I snuck off, and got myself into the corrals, reuniting with Dina (who took video of my anthem) and Nicholas, and we were off – rounding the gravel track on the fairgrounds, before exiting eastward onto the out and back on the rolling Monroe Avenue and Monocacy Boulevard, with the finish line back on the fairgounds track. It was a fairly warm evening, so I was pretty sweaty by the end of the run! I finished in 30:13, and then met back up with Dina and Nicholas, who finished just behind me, while also taking photos with other friends who spotted me at the finish line. 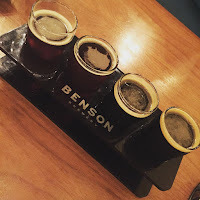 After taking in a cup of Harpoon beer (sponsoring the weekend), we drove back to Virginia to get Dina’s husband Chris and then go out for dinner. After a good night’s sleep, I woke VERY early the following morning to drive the hour back to Frederick and to be able to park in the adjacent lot by 5:30am. 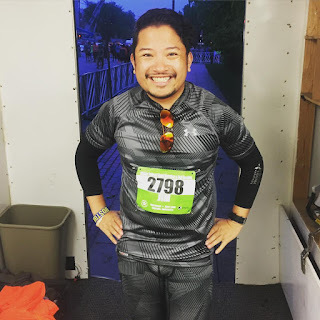 The race wouldn’t start til 7, so I took my time to acclimate to the chilly weather, which warmed up by the time the race started to 54° thankfully! 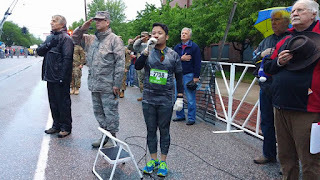 Again, I sang the national anthem at the startline, this time starting on the long stretch of Patrick Street in front of the fairgrounds, with the light of the morning sun peeking through the treelined street, as Sid Busch held the American flag, which he ran with for both races. At 7, we were off, heading straight into downtown Frederick, making a left turn onto East Street, and then making our way to the western part of Monocacy Boulevard, which turned into New Design Road, and rounded Loats Park. 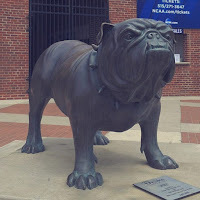 We turned right onto Stadium Drive, and ran on the road between Mount Olivet Cemetery and Harry Grove Stadium, as we ran northward back into downtown Frederick. We then took a slight left onto Market Street, one of the main drags of historic downtown Frederick, as we passed the 5K mark, and many locals lining the streets cheering us on. We turned left onto 6th Street for two blocks before turning again onto Bentz Street, hitting mile 4 at the turn onto Carroll Parkway, as we ran along the south edge of linear Baker Park. Along the way, a fire truck was parked in a house’s driveway, with an American flag hoisted on its ladder, cantilevering over the street. Just before mile 5, we passed Frederick High School. We turned onto Kline Boulevard, and into Fairview Avenue in the neighborhood of Westbrook as we made our way back near the park, this time on the northern edge of the park at West 2nd Street. 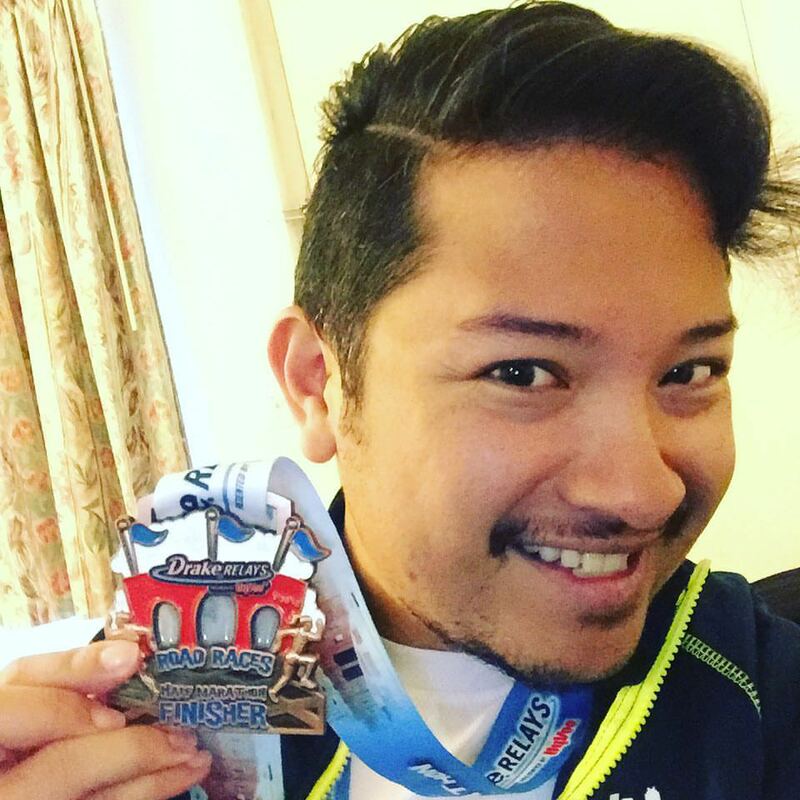 I felt really strong that morning, clocking in sub 10-minute miles for my first 7 miles. 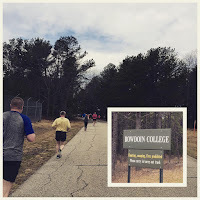 We headed back into downtown, weaving in and out of roads, and even running through a portion of the local institution of higher education, Hood College. Until then, the hills weren’t really too bad – they were definitely there, but they weren’t affecting me like I thought they were going to. 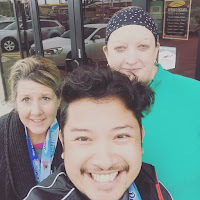 Then we had a pretty rough one during the 8th mile, as we weaved through streets in the northern part of the course, along Fairview Avenue, Market Street, 16th Street, and then finally to the Fredericktowne Village area at mile 10. 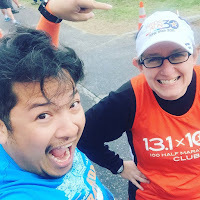 We turned right onto Schifferstadt Boulevard, and had a nice long downhill section, before we were so cruelly encountered with a short out and back on Church Street before hitting mile 11. Before long, we were back on Monocacy Boulevard, like the night before, making our way on familiar roads to the finish line, but this time, skirting a road north of the fairgrounds (Highland Street), as we were cheered onto the finish on the gravel track, once again. 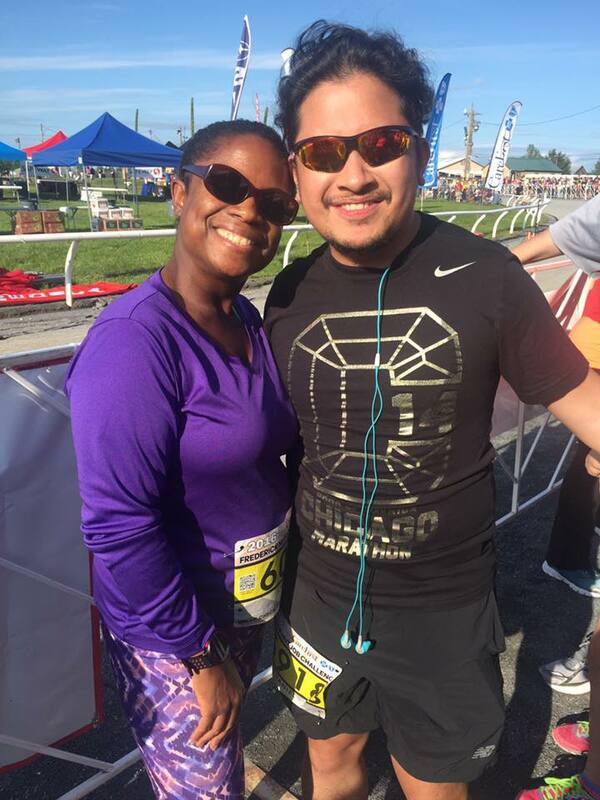 I finished with a strong 2:11:32, happy to complete yet another half marathon! 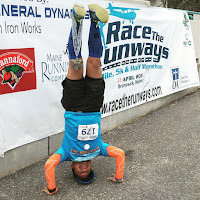 Victory Headstand in the Fairgrounds! 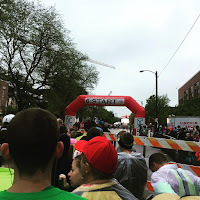 I stuck around and went up to the stage, which was cordoned off as a VIP area that I got access to for having sung the anthem, and cheered on friends as they finished, and in particular my friend Travis, who was able to qualify for Half Fanatics with this race! 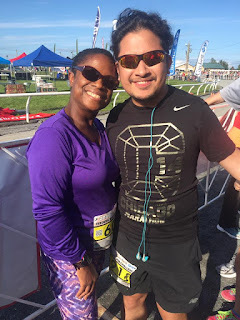 I also got to meet a new friend Offie, who was decked out in all colors and patterns of the Maryland flag – he had been near me at the start, and I was able to catch him finish the race as well. After a quick pasta meal on the stage to refuel (thank you again, Dave, for providing the VIP pass), I headed back to Ashburn to get showered and packed up at Dina’s house, before we took separate cars to celebrate Mothers’ Day at Reston Town Centre, at one of Dina’s favorite restaurants, Passionfish. 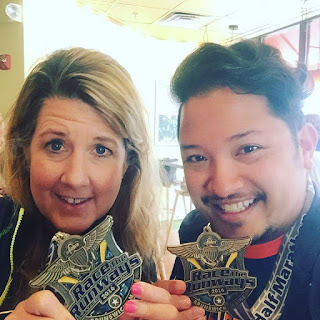 After lunch, I headed back to Dulles for my flight home – braving an extremely long TSA Precheck line – but happy I got another half marathon checked off my list! New friend Offie, decked out in the colors of the Maryland state flag! 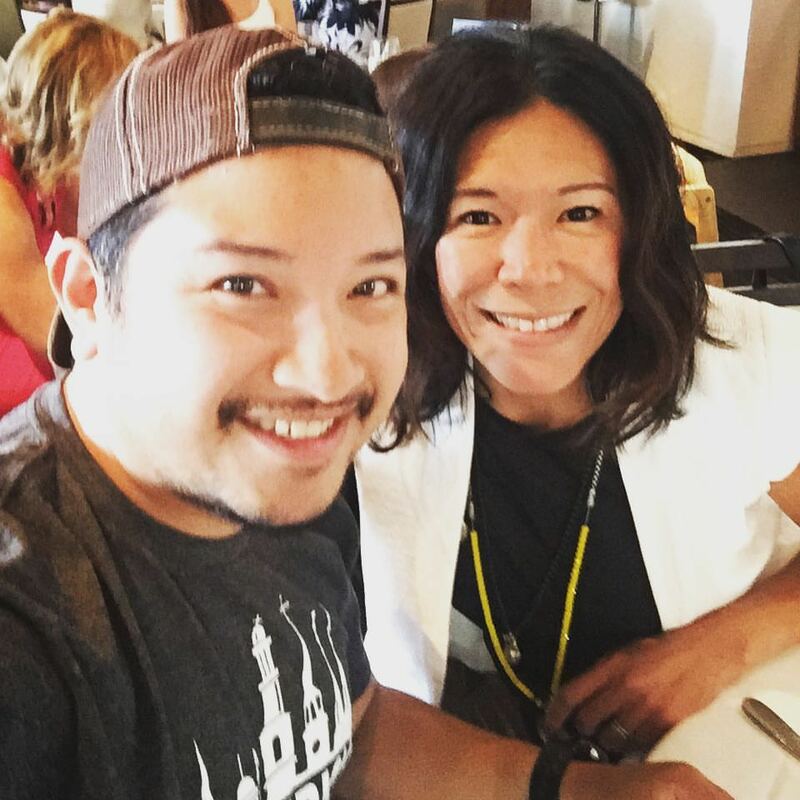 Always a blast to see my gorgeous friend, Lilian! The beautiful D'Agostino family, thrilled to have been able to spend the weekend with them! I'm in the paper, ma! 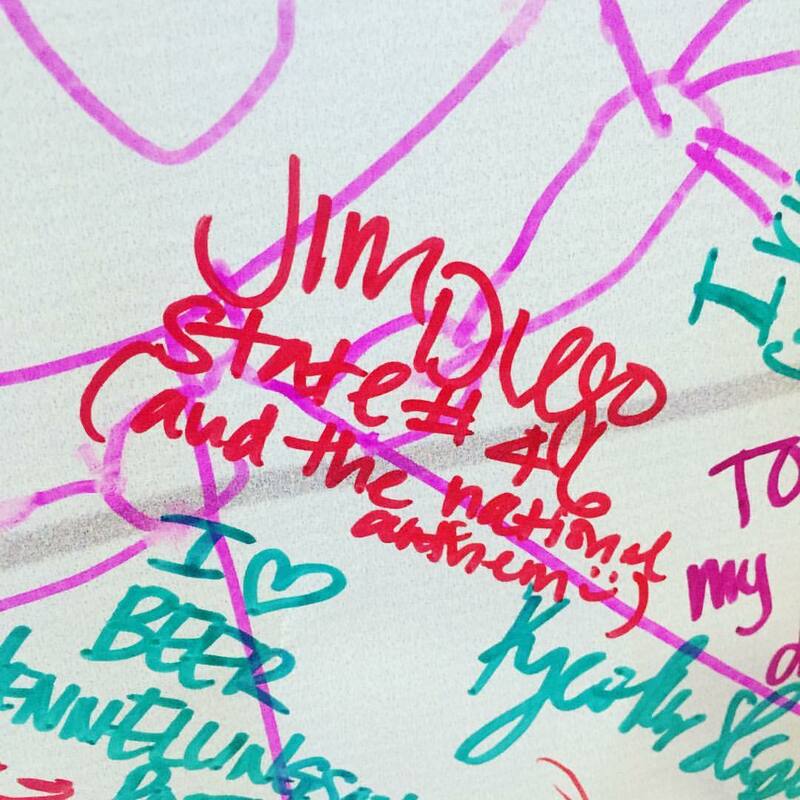 When we last left off, I was prepping a double weekend, where I would mark off two new states - Iowa and Nebraska. 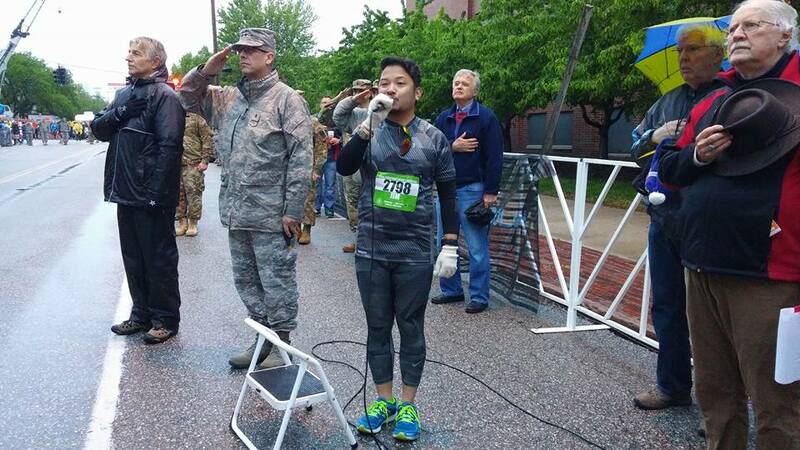 It just so happened, I was also given the chance to sing the national anthem at both races as well. Earlier in the week, I got an e-mail from a reporter from the Lincoln Journal Star, who was contacting me because the race director for my Nebraska race, Nancy Sutton-Moss, had floated my story to him for a feature article. 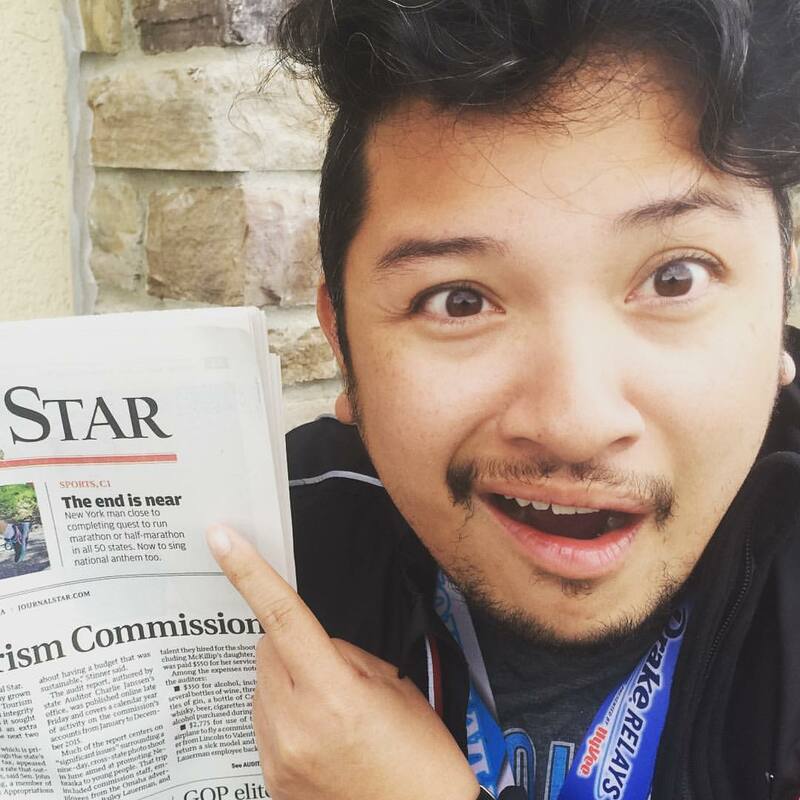 We had a lengthy 40 minute conversation, and the article went live on the Journal Star's website on Friday morning and then was featured in the printed newspaper on Saturday morning. 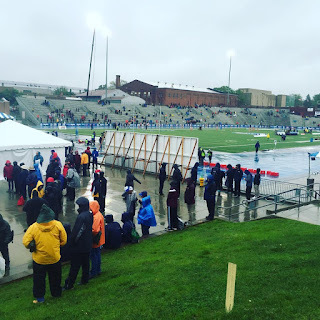 The Des Moines race was WET WET WET. After the race and getting cleaned up, we headed out for brunch in Des Moines, and then afterward, Dana and I took off down I-80 to Nebraska, and to its capital, Lincoln, for the Lincoln National Guard Half Marathon and Marathon expo. It rained almost the entire way there, for the duration of the three hour drive. We arrived in Lincoln to a very busy expo at the Lincoln Marriott Cornhusker hotel, notably packed for the last couple hours of the expo being open. It seemed everyone was picking up their packets at the same time! And the article had definitely been read by locals - some noticed me from the picture that went along with the article and congratulated me on my accomplishments. It was prom night too, as several young high school kids were dressed to the nines prepping to go out for the evening. As we were leaving, I got a phone call from Bill Rentschler, a video journalist with the local CBS affiliate 10/11 News Now. Nancy had contacted Bill, as well, to see if he wanted to cover my story for a segment on the news! We arranged to meet inside Memorial Stadium at the completion of the race. 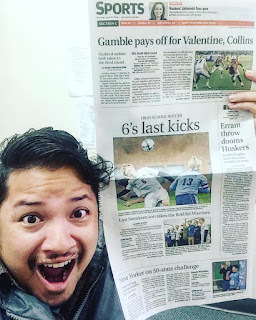 After stopping by the Journal Star's offices in downtown Lincoln to pick up some physical copies of that day's newspaper, Dana and I drove out of Lincoln northward to Ralston, an Omaha suburb about 45 minutes away, where my friend Jamie was hosting us for the evening. Would've gotten the shirt if it wasn't so darn expensive. I met Jamie at Rock 'n' Roll Arizona 2015, and subsequently kept in touch with her over Facebook, sharing our love for corgis. 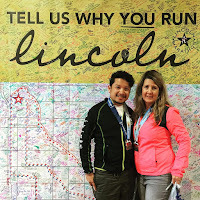 While she was not running Lincoln, she had several friends who were, and was kind enough to host us, and also join us for the VERY early drive down to Lincoln, where she would spectate and cheer at the race, handing out candy to runners at the 11 mile mark. That evening, after settling in at Jamie's house (and putting out our wet clothes to dry), we took Jamie out for dinner as a thank you for housing us for the weekend, going to Benson Brewery in the northern Omaha neighborhood of Benson, recommended by my friend Katie as one of the best breweries in the metro area. A super early morning got us out of Ralston for the 45 minute drive south, and we got into Lincoln pretty easily, bypassing any major traffic issues, and parked in a structure about 1/4 mile away from the start area on the campus of the University of Nebraska. It continued to rain as we drove down to Lincoln, and as we walked over to the start area, it was drizzling lightly, thankfully not as wet as the day before. 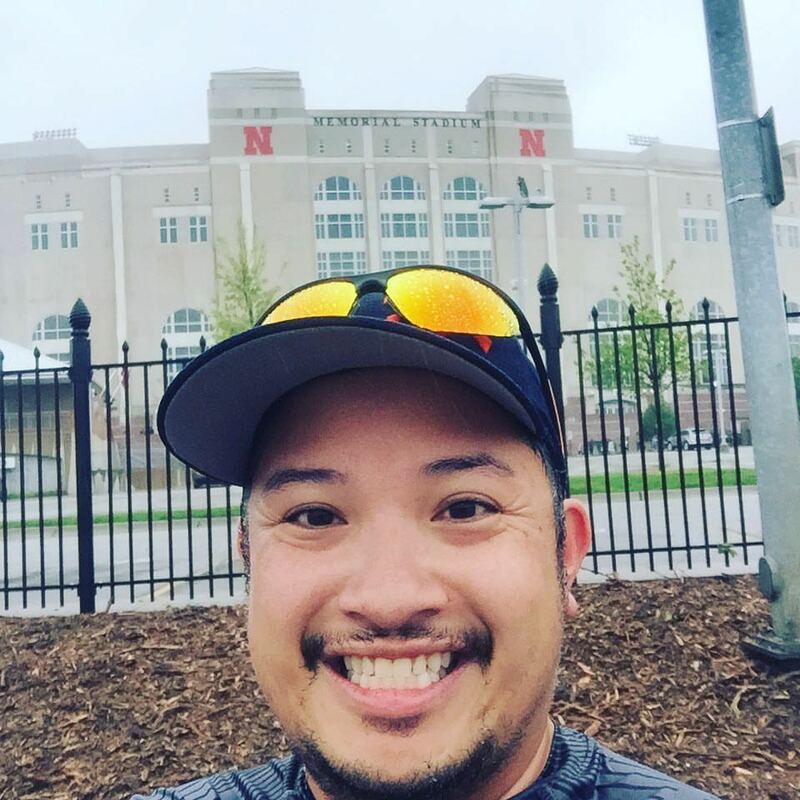 We stopped over to The Coliseum (former home of the Nebraska basketball team, currently the arena that houses NU volleyball) to make use of the bathrooms, but the lines were so incredibly long, I decided to forego them and head to the start and meet the RDs and warm up a bit. Thankfully, there was a trailer near the start, where I (along with Jamie) warmed up for about 15-20 minutes before the race start. 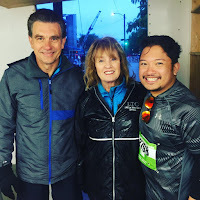 Finally meeting Nancy and her fellow co-race director Gary, I thanked them for the opportunity to sing the anthem for this race and for the connections with local media. Soon, the announcer introduced a few folks to make some remarks, and then I was up. I took the anthem nice and slow, considering the sound system, and finished singing the "Star Spangled Banner" in my eighth state! 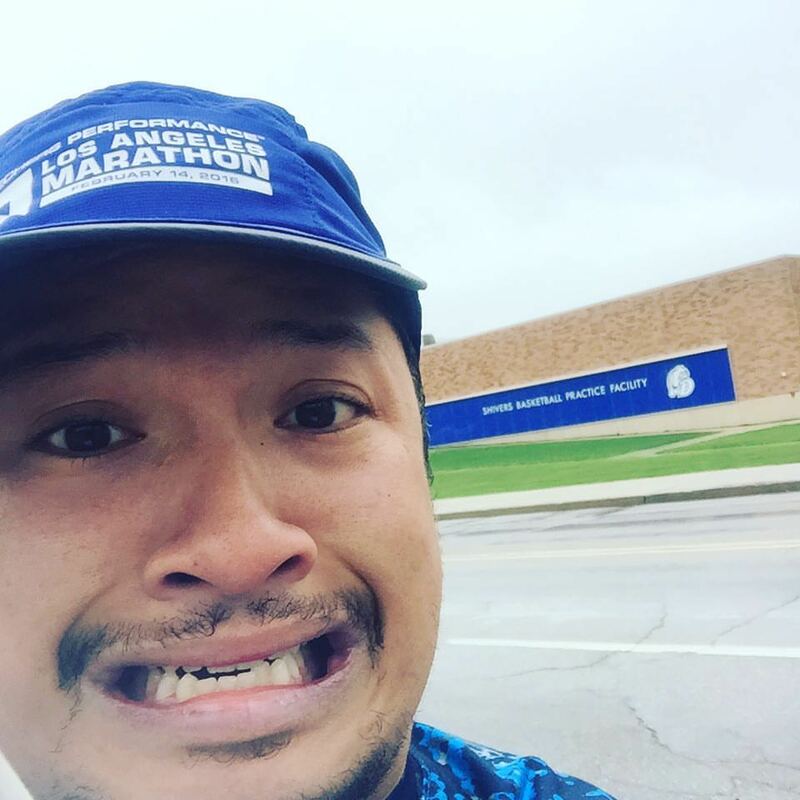 Moments after finishing, I quickly headed off into the corrals, squeezing myself through some barricades. 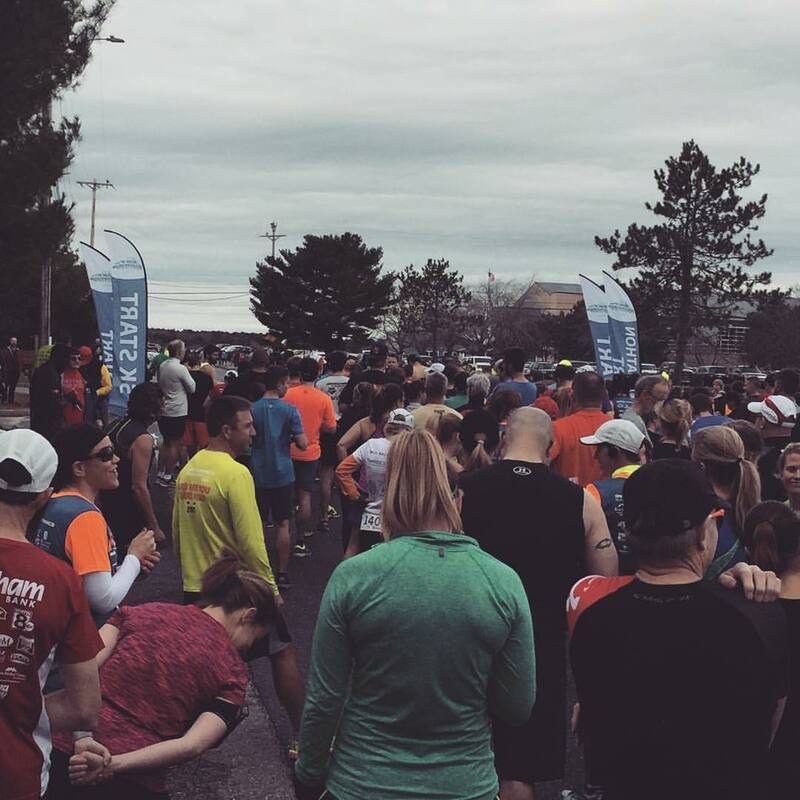 The corrals were let off very gradually, allowing only a few hundred runners out at a time, so there were some longer waits in the corrals. 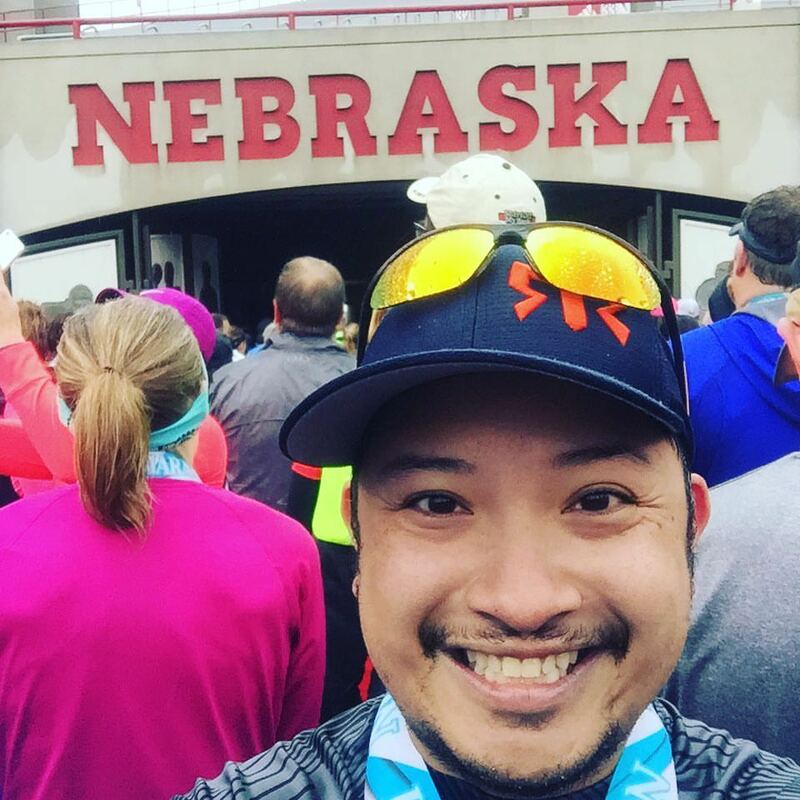 Within 15 minutes, I began my second 13.1 miles of the weekend. Prepping in the trailer before the race! 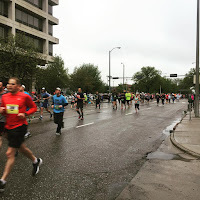 We set off from the start line on N 14th Street, turning left onto Vine Street, running two blocks over to N 16th Street, and our first long stretch of road. As we ran southward on 16th Street (and as the streets we were crossing began to progress with the alphabet in reverse, meaning U Street, T Street, S Street, R Street, and so on), we passed several fraternities and sororities, some looking like its residents were still asleep (or probably running the race? Who knows?!) 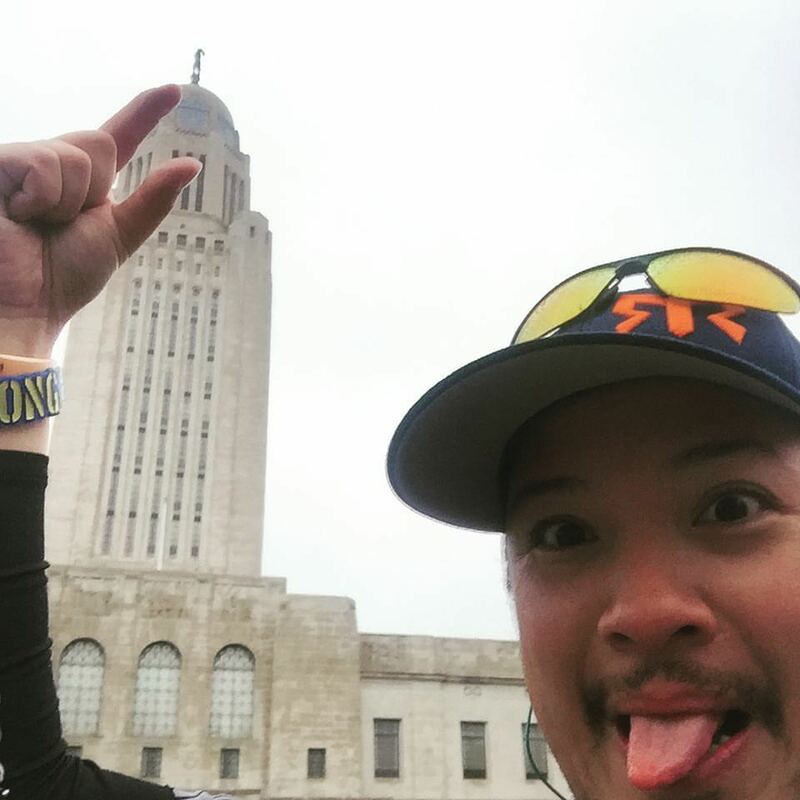 The skies continued to drizzle lightly as we ran, and about 3/4 of a mile in, I took my first picture stop, capturing a picture of me with the Nebraska State Capitol, a notably phallic looking building, in the background. Just past my 9:33 first mile, I stopped again to take a picture directly in front of the building. I mean... I had to. In fact, I had a crazy idea of making this be the background of my victory headstand photo! We pressed on, running through the Near South neighborhood, home to many of Lincoln's grand historic homes and is currently experiencing a revitalization effort by the neighborhood association and city officials. Many homeowners here are reconverting properties that were once divided into apartments back into single-family homes. I clocked another sub-10 minute mile, before turning left onto South Street, a commercial strip. Oh look, there's the Nebraska State Capitol building! Making fun of the building while on the run... lol! 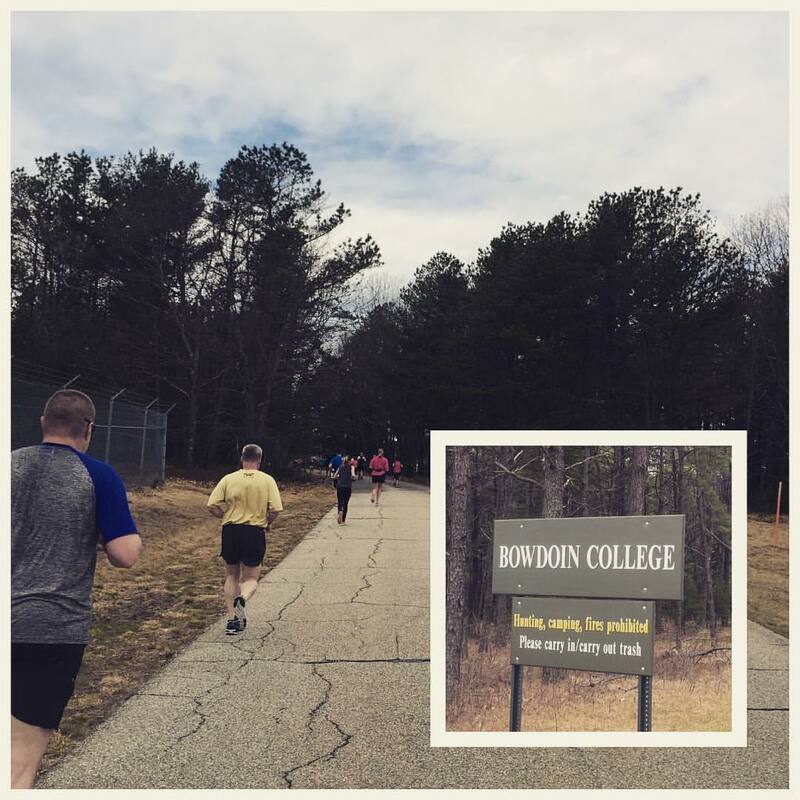 South Street was our first elevation challenge, rising 58 feet over the 3/4 mile stretch. It was very gradual, so not as noticeable, but by the time we clocked our third mile after turning onto Sheridan Boulevard, I clocked in a 10:07 mile - still not bad. I was feeling good, not feeling too cold, and happy that I had worn gloves this time around! Sheridan Boulevard then marked one of the more fun stretches of the course, running a mile through the neighborhood of Country Club (and at one point, running past a house with a front yard covered in Ben Sasse posters - the Republican Senator representing Nebraska who won reelection two years ago). We passed a couple narrow areas around some of the roundabouts along Sheridan, and reached the mile 5 mark while passing by the beautiful homes and hundreds of spectators in the neighborhoods of Greater South and College View, all the way to the end of Sheridan Boulevard until it merges with Calvert Street. We continued down Calvert Street before turning right onto South 48th Street. South 48th Street was a nice 1.2 mile downhill, where the elevation dropped 87 feet. Along the way, we passed Union College, a smaller four-year college for which the College View neighborhood is named. 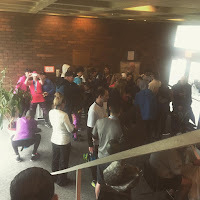 It was a great stretch of road, filled with tons of people braving the crummy weather, and cheering us right along to the 10K mark as we moved onto the Helen Boosalis Trail (named after Lincoln's first female mayor), that snaked through 40th and Highway 2 Park and then crossed a few streets closed off to the runners. This marked the first part of the race course that was mostly devoid of spectators. We were left to brave the wind (we were right next to the highway) as we ran the next 2.2 miles along this paved trail. We skirted the southern borders of the neighborhoods of Bishop Park and Country Club, before finally exiting off of the trail, turning right onto S. 20th Street (the eastern border of the neighborhood of Indian Village) and immediately seeing what lay before us... a 60 foot incline over a 1/2 mile, all the way up to Calvert Street. We continued along 20th Street, feeling relieved that we had a little downhill just after that incline, then turned left onto Harrison Avenue into the homely neighborhood of Irvingdale. About to turn into the parking lot! The last mile was TOUGH. Though the road was more familiar, as I had driven it in the last couple days, and the stadium finally came into view, I was a strugglebus getting myself up Salt Creek Roadway, the frontage road that ran alongside the onramp from S 10th Street to I-180. 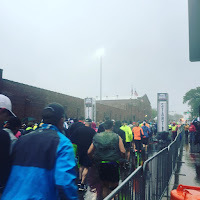 This road curved around the parking lot of the stadium, turning onto Stadium Drive, as we were left to finish the last 400 meters of the race, seemingly the toughest for me. However, the turn INTO the stadium was right there, as we were cheered on by hundreds of folks, and we made our way on the incline into the stadium, finishing smack dab in the middle of the stadium on the 50 yard line... a different finish than the Knoxville Full, which was on the 50 yard line as well, but along the side of the field. 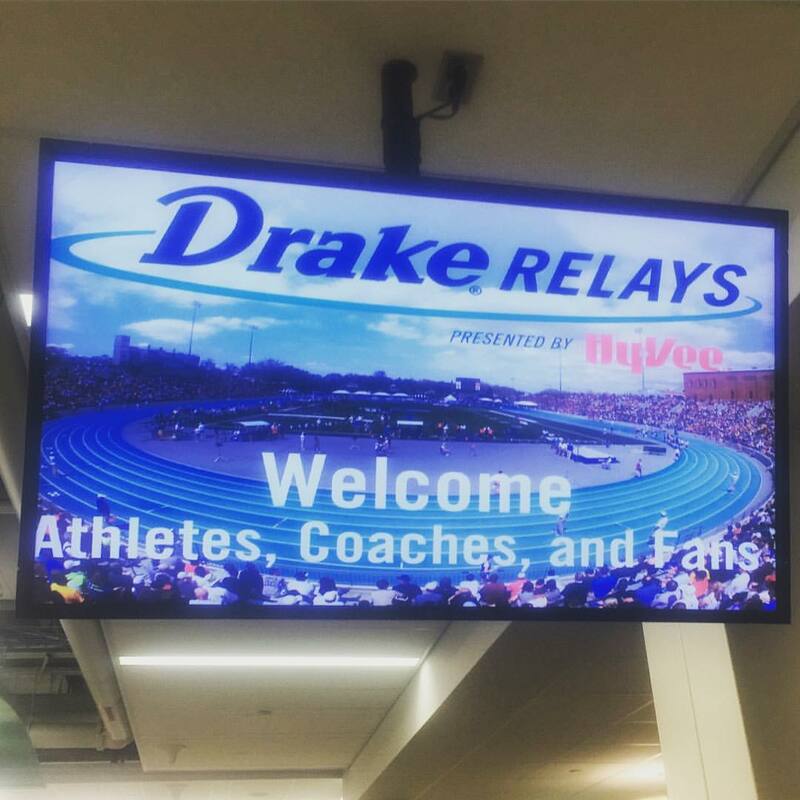 I crossed the finish line in 2:13:56, 5 1/2 minutes faster than my finish time at the Drake Relays Road Races the day before. To say that I was ecstatic was an understatement... 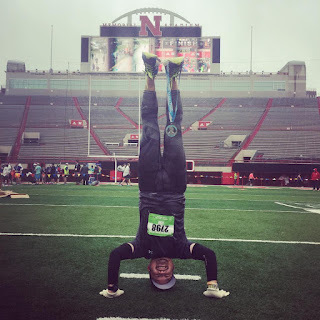 I felt really good, and was happy to be able to finish on the field, and in much better weather than the previous day. As I finished, I found Bill, who had caught me crossing the finish line and then brought me back to a spot on the field where he conducted a roughly 10 minute interview, where I did my best to answer his questions with my frozen fingers, face, and... basically, marathon brain. After having him do my victory headstand photo on the field (it was far too cold to get back out to where the capitol building was), I stood in line to get through the post-finish chute, and found a spot to warm up a bit; I tracked Dana and had her coming in about half an hour after I finished, since they were letting out corrals slowly at the beginning. I landed about 40 minutes early in Des Moines and called my friend De Moe, who had booked a room at a nearby Motel 6 for us. Originally, he was going to pick me up and we were going to head back to his home in Marshalltown, roughly an hour away, but with my late arrival and our early morning on race day, he decided to book a room at last minute - however, the city was experiencing a very high occupancy of rooms (due to the estimated 40,000 people attending the Drake Relays and the estimated 90,000 people attending the six sold-out Garth Brooks concerts at Wells Fargo Arena). After a quick trip to the Hy-Vee for water (and some gifted "Prairie Fire" cinnamon whisky, only made in Iowa by Iowa Distilling! ), we settled in for the night in the musty, cigarette-smoke smelling, and overly heated Motel 6. I was tired enough to crash while watching TV and thankfully, did not have any itchies the following morning from sleeping in the bed. 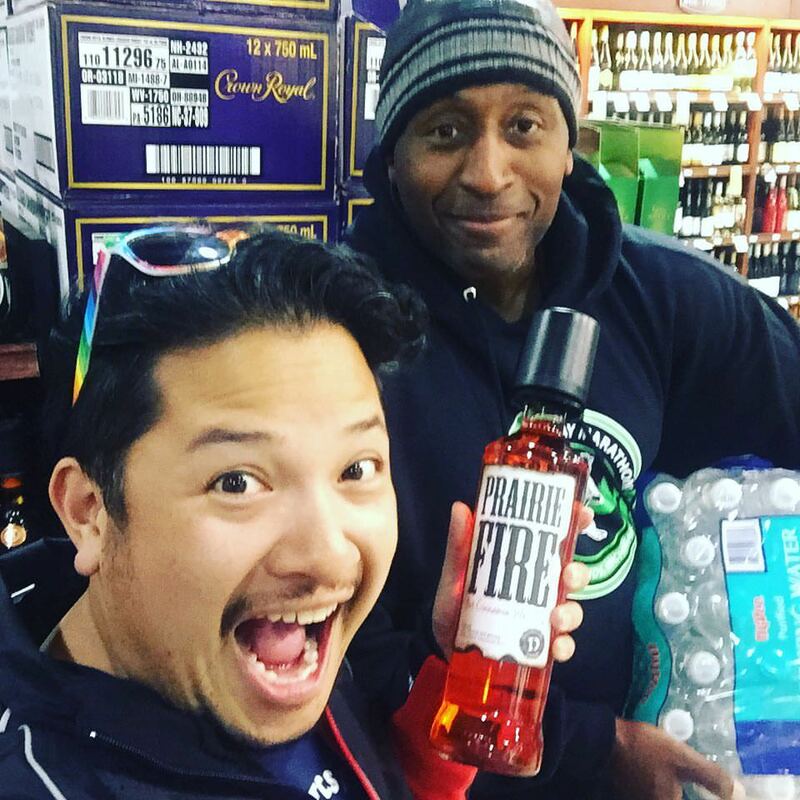 PRAIRIE FIRE to bring back home! We woke around 5:30, so we could leave the hotel by 6:10, anticipating potential parking issues - but none were to be had, and we were parked in a spot literally a block away from the stadium before 6:30. We headed out to the stadium around 6:50 (forty minutes prior to the start) and the turnout was pretty low, still. We sought refuge inside the stadium grounds, and out of the rain that had begun to fall, and I sucked down some water, used the facilities, and then headed out to the startline, which was still being set up at around 7am. As I was singing the national anthem for the race, I was given access to the small white tent housing the sound equipment prior to the race start, where I met the race director and the announcer. during the race. It was too wet! 7:25 came, and the rain began to fall a bit heavier. There was a platform located right at the startline on Forest Avenue, just in front of the stadium, where the announcer, and later the recently installed president of Drake University, spoke. I sang the national anthem from there under a steady rain, and soon, we were off... with the rain falling harder. 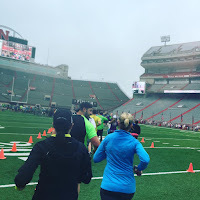 Just before crossing the start mats, I took a quick picture and then shoved my phone into my fanny pack to shield it from the intensifying precipitation. We took off down Forest Avenue, making a right turn onto 24th Street, then headed south before turning right again onto Drake Park Avenue for a quick one-block shift over toe 25th Street, crossing Cottage Grove Avenue, and then turning right again onto Kingman Boulevard, where we would remain 1.5 miles. As we passed the mile markers, I noticed that each of the markers was manned by a person yelling out real-time gun times from a stopwatch. 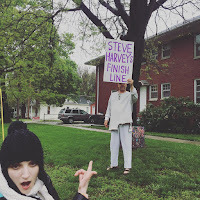 There was one stationed at each of the mile markers all along the route - something I had never seen before at another race -- and they stayed there through the rain, cold, and wind, for all of us! As we headed westward on Kingman Blvd, we turned left onto Polk Boulevard, heading south toward the 3 mile mark into the neighborhood of Ingersoll Park. We then turned right onto Woodland Avenue and then the left side of the fork in the road toward Country Club Boulevard which turned into Waterbury Road, a nice downhill into this residential area, dropping about 150 feet in elevation over the course of 1.2 miles. 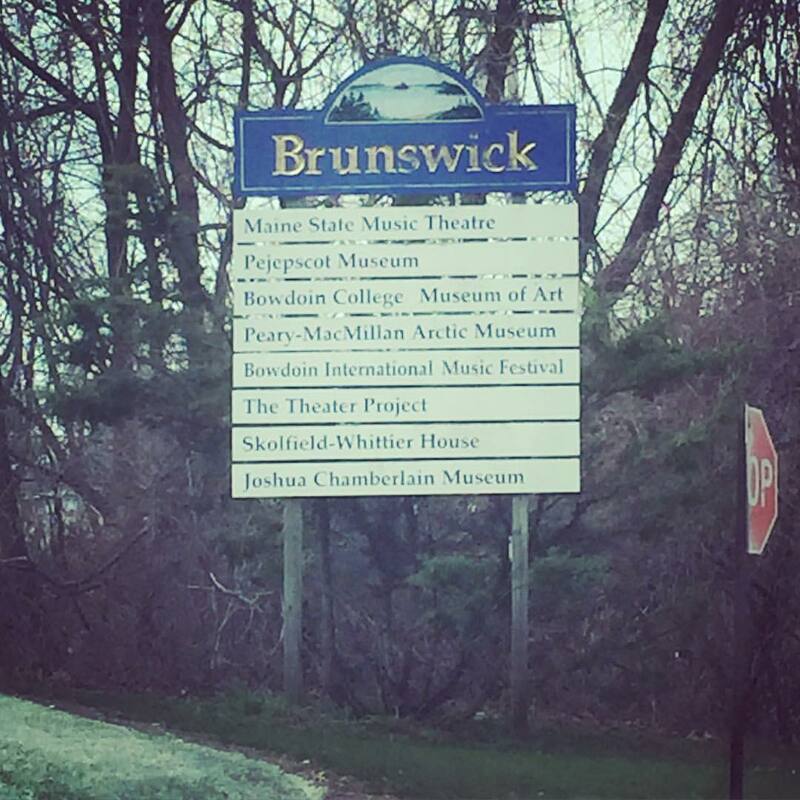 Running through a heavily wooded area, we were surrounded by some majestic homes perched upon hills over the curved, meandering lowland road, elements that define the Waterbury neighborhood. We crept northward on 59th Street up to the Cummins Parkway into Waveland Woods, and I finally took a bathroom break at a port a potty located along the parkway median. We crossed over I-235, and into Merle Hay, another northwestern neighborhood of Des Moines, before continuing northward on 53rd Street. 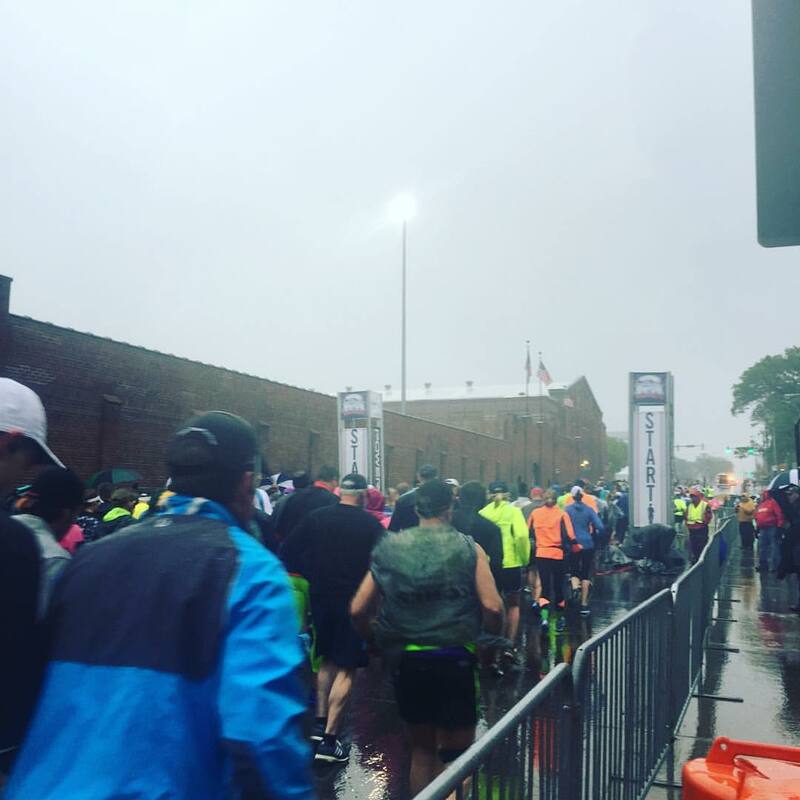 Soon we were at mile 7, as the rain continued to pour down on us, and my shoes and socks were beyond soaked. We finally turned eastward onto Urbandale Avenue, as we were asked to run along the bike lane and into the wind. Somehow, I picked up a bit of speed here, because I began to pass several folks along the way, and improved my mile pace compared to the previous three miles since the downhill segment. Still, while running in the bikelane, we were pushed more into the street due to the overflowing curb drains, having to run in the narrow section between the cones and vehicular traffic and the drain. We turned onto 46th Street, then headed eastward onto Franklin Avenue into the neighborhood of Beaverdale. 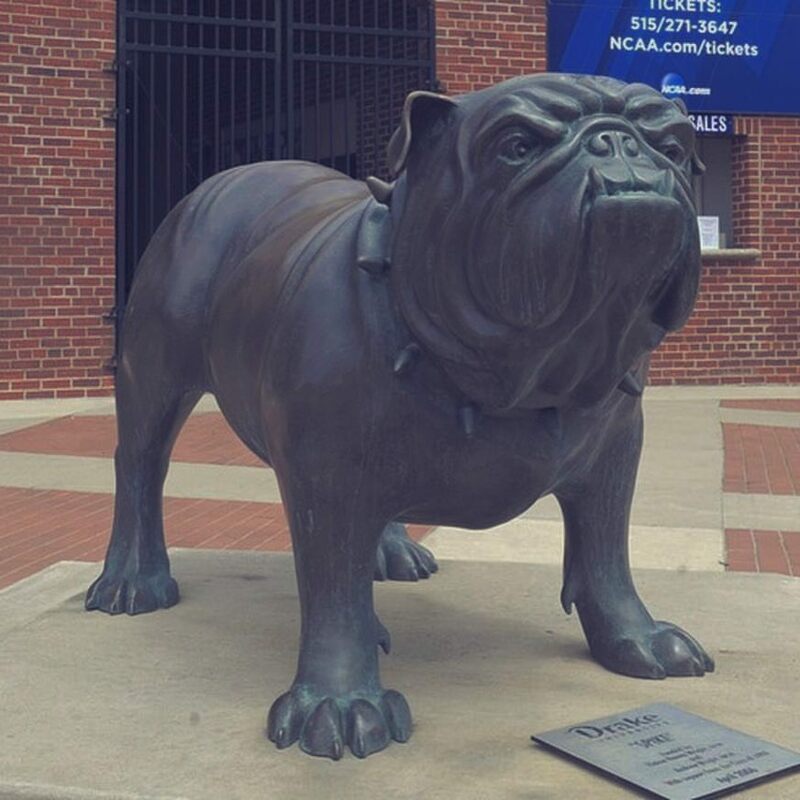 We made our way around Witmer Park, curving back down toward Forest Avenue, and the 10 mile mark, where we could actually hear the loudspeakers blaring music coming from Drake Stadium. Of course, we then proceeded westward onto Forest, away from campus, in order to pull in our last 5 kilometers. We took a left onto 46th Street, passed the 11 mile mark, then returned back to Kingman Boulevard, where we ran in the opposite direction of when we had come in the earlier miles. With only two miles left to go, I booked it as best as I could, heading to the finish line on 25th Street just past Carpenter Avenue on the Drake University campus. 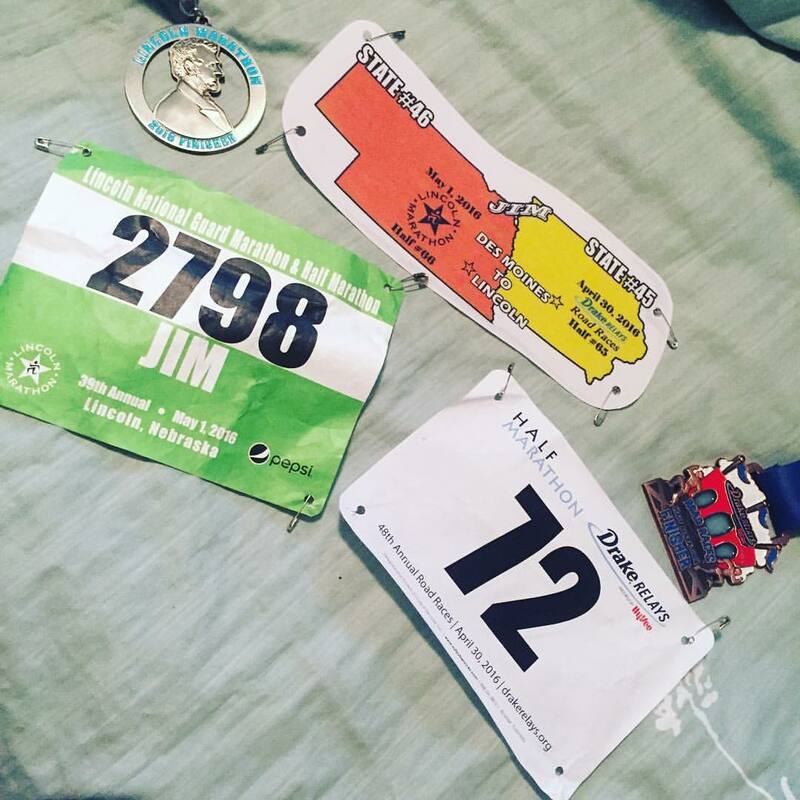 I finished under 2:20, which what I was hoping given the weather conditions, and completed my 45th state on surprisingly hilly course in 2:19:26. Hilly, but definitely not hilly like Kentucky or Tennessee. In fact, there was really only about 161 feet in elevation difference between the minimum and maximum elevations on the course. Cruel... chattering teeth and cold and windy temps, and we pass a building called "SHIVERS"
When De Moe's around, fireball, or in this case Prairie Fire, is also around! 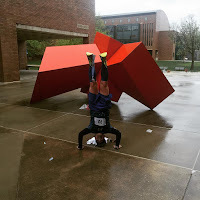 Victory headstand... in the rain. 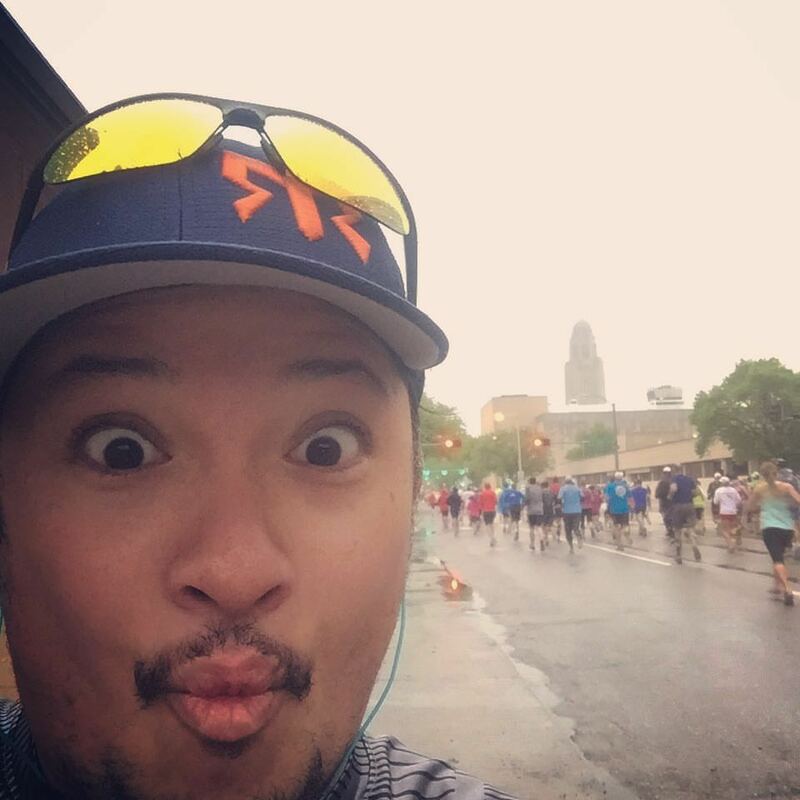 The rain, wind, and cold temperatures were definitely a factor in this race. 46 degrees with a 15 mph wind at the start made it feel more like 40, and with the wetness, made me feel extremely chilly by the end. I had opted to go for shorts for this race, and definitely felt it at the end when trying to warm back up again - and it took quite some time. It's probably the most awful weather I've ever had to run in. I waited for De Moe and Dana to finish before making arrangements our arrangements for the rest of the afternoon - De Moe and I went back to the Motel 6 to peel off our waterlogged clothes, socks, and shoes and showered; I picked up my rental car from the airport across the street; we waited for Dana to return her car, and then I picked her up as De Moe went to get gas in his car; and we then met up with De Moe for brunch at a delicious restaurant near downtown Des Moines before heading off to Nebraska. All the while... it continued to rain. Much needed food, post race! Three amigos post race, and post brunch! I was in Maine last summer, but it was a very quick trip -- a plane to Boston, and then a bus up to Portland from the airport, with the Shipyard Old Port Half the following morning, and then an exodus by the early afternoon to Massachusetts. 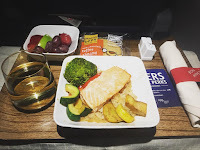 The story starts similarly this time around; with it being the end of April, my cousin Kathy (a JetBlue flight attendant) secured me a buddy pass on a JFK to PWM direct flight, but with the days getting closer to my departure, the available seats began to dwindle at an alarming rate. By Friday, the seats were practically gone, and I was 3 or 4 down on the standby list. 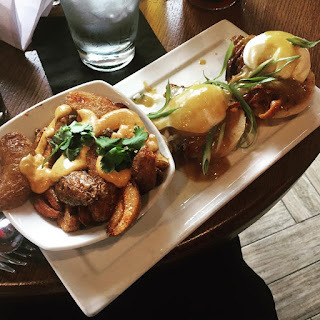 Our second option - get me to Boston, and then I can get on the bus again. So, Kathy got me on standby for the Boston flight, though I was waaaaaay down on the list, maybe 12 or 13. Nevertheless, I got myself to JFK (always easy from my job, it's a 20 minute trip, tops), and bypass the massive security line at T5 with my trusty TSA PreCheck, and sat at the gate, awaiting word if I'm able to get on the flight. Boarding begins, and everybody files on board, while 6 of us wait with bated breath if we're able to get on the flight. The boarding door is about to close, with the 10 minute rule and several checked-in passengers have not made it to the gate, so those of us waiting are shuttled behind the door, and are put onto the plane LITERALLY at the last moment. It's a quick flight over to Boston, and as soon as I land, I beeline my way to the ground transportation stop where the bus to Portland comes hourly, and I get on the bus for the two hour trip northward to Maine. Upon arrival, I still need to make my way to the airport to retrieve my car rental, so I hail an Uber to take me the 2.5 miles away to Portland International Jetport, where I have my rental car waiting at Hertz. I then drive 45 minutes north to Brunswick, where my friend Dana is waiting for me at the Best Western she booked. As it was already a very late night, and the race was the next morning, we killed the lights and shut down for the evening. Step and repeat with Dana! Bright and early the following morning, we were out the door, kindly asking for some extra time at check out (the lady from the night before was not so accommodating...), and then proceeded to the startline of the race on the grounds of Brunswick Executive Airport, a public use general aviation airport that used to be Naval Air Station Brunswick, before it was closed in 2011 as part of the 2005 Base Realignment and Closure committee decision; and "Brunswick Landing: Maine's Center for Innovation," a business park. 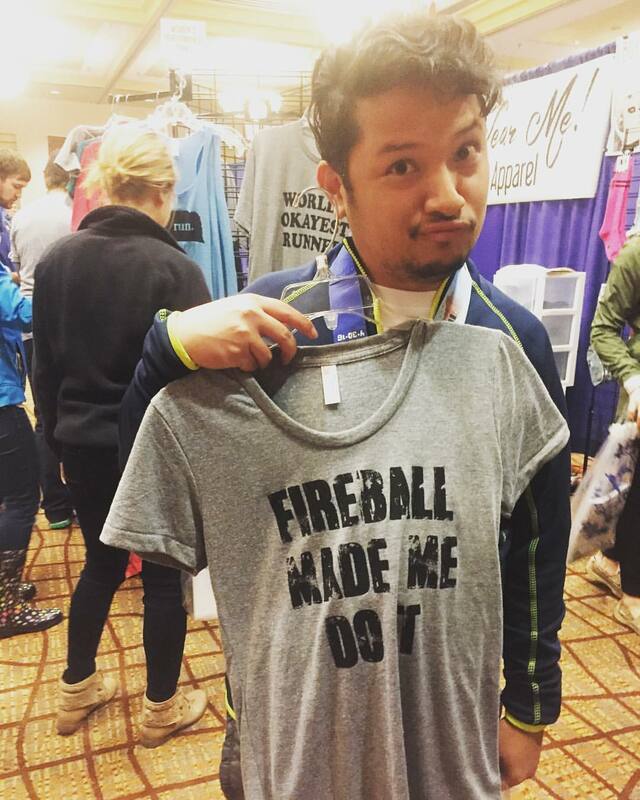 "The 2016 event is the 6th year of the race. 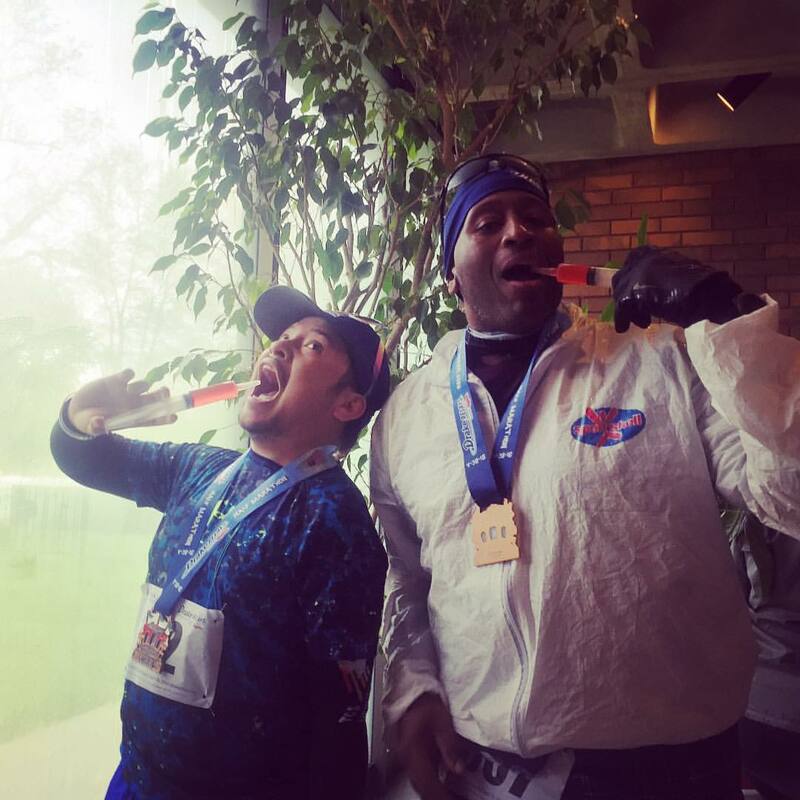 The Half Marathon is unique and challenging. 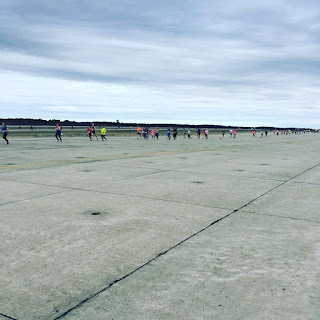 It is one of only a few races (that we know of) run on an active airport. While it’s practically flat, it’s the wind that may make it challenging. Some years its been dead calm and in others, we’ve had gusts over 50 mph. 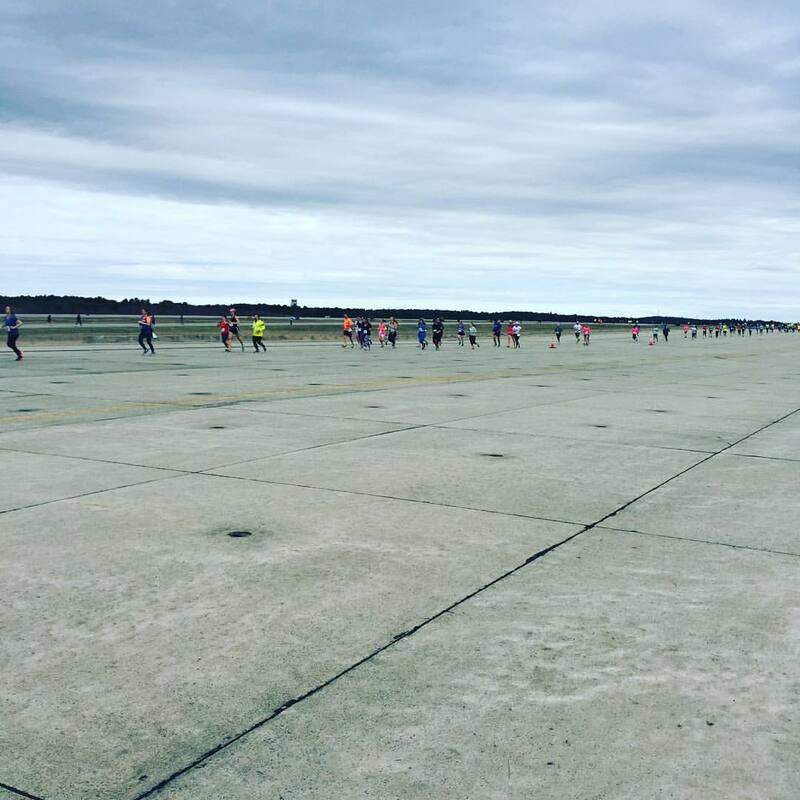 Over 4.5 miles are run directly on the runways. Don’t worry about aircraft taking off or landing. We are in communication with every plane landing or taking off. 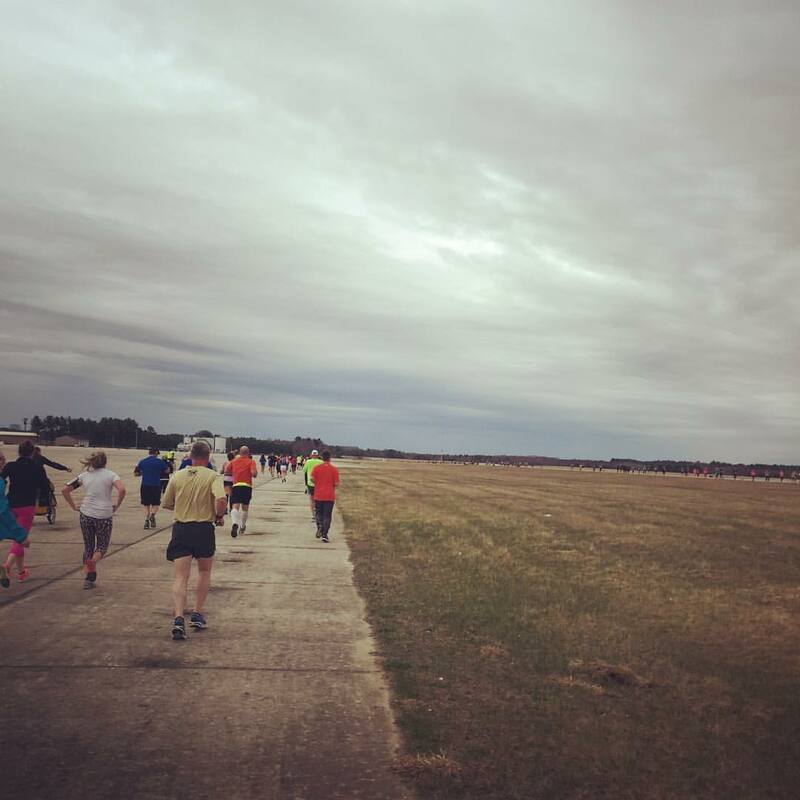 We run on the INACTIVE runway right next to the active runway. 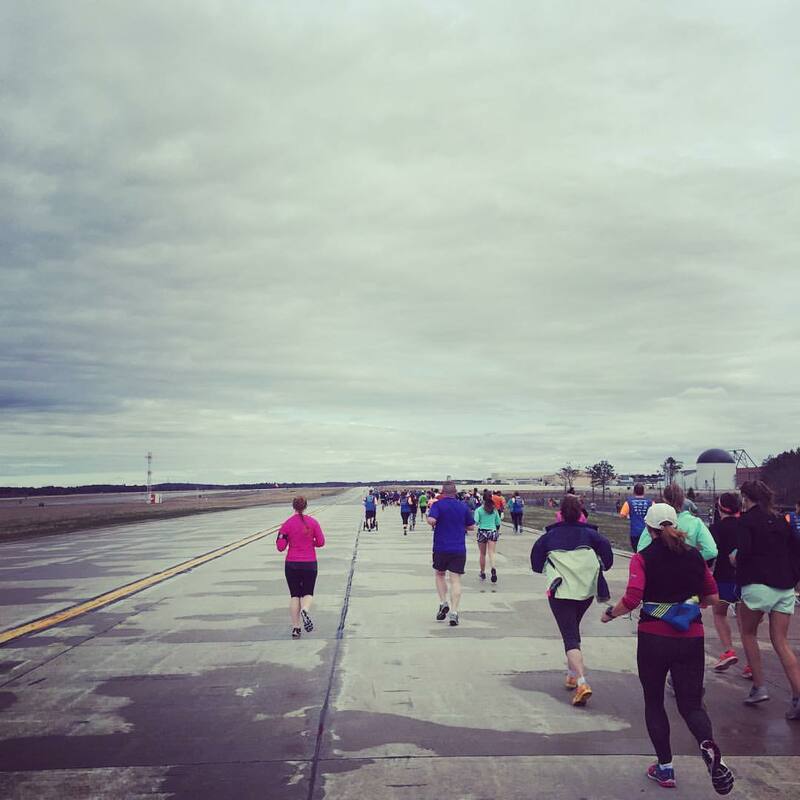 The event benefits Veterans No Boundaries, The Road Runners Club of America – Kids Run the Nation program and the Coastal Humane Society. 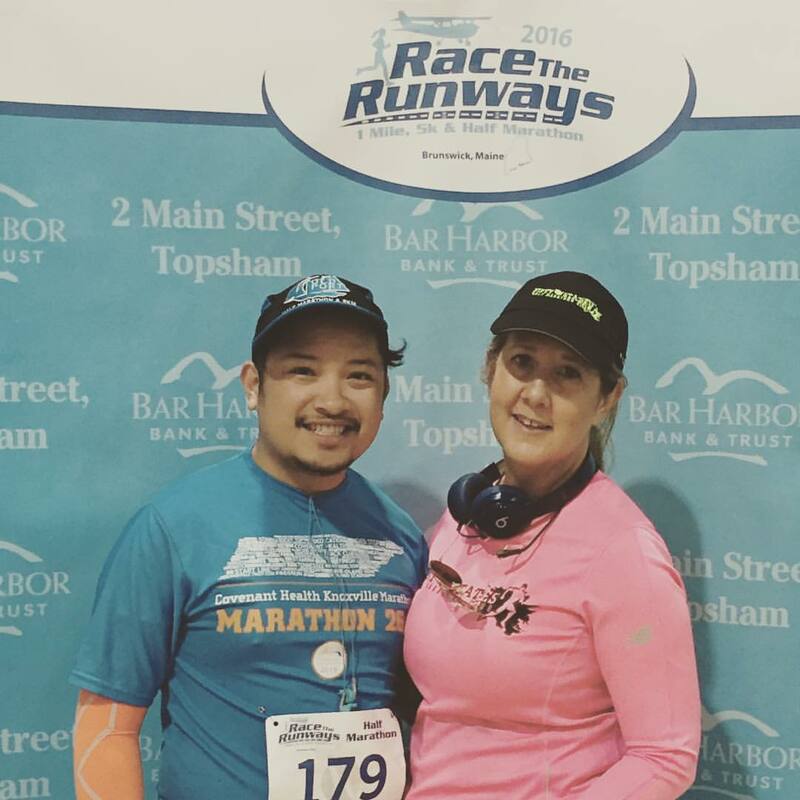 The MidCoast Triathlon Club is a Non-Profit club who believes in promoting health in our community. Our club welcomes Swimmers, Bikers and Runners of all ages and abilities to join our group training events. 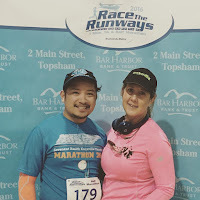 Our goal for the Race The Runways is to hold a quality event for runners and walkers promoting health and fitness in our MidCoast Maine community." Andrea wearing a Pride Run hat! This year, the race date was pushed back three weeks at the request of the airport, because of the weather. The race directors had to do extensive plowing last year to open blocked roads. Thankfully, with a milder 2016 winter, there was no snow affecting this year's race, and the day's temps were considered the best temperatures the race has ever received in its short six year history. It was a nice later race start than we were used to, with a 9:30am gun start. We arrived early enough to meet up with friends Andrea from Rhode Island and Carmen from NYC, and catch the 1-milers (including Carmen) do their thing. 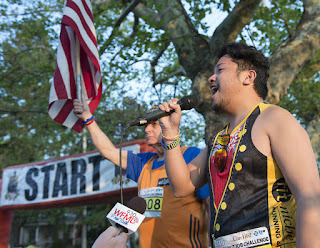 At 9:15, everyone assembled together onto Neptune Road, while race director Mark Grandonico made final announcements before we we set off, and then introduced me to sing the national anthem. I did my thing, and then headed back with Dana, Andrea, and Carmen to a good corral area in the middle of the pack, and then we were off! 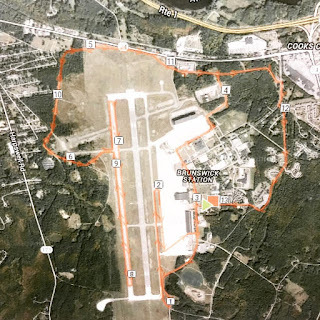 We turned left onto Orion Road, went past a set of intimidating looking gates and at the 1 mile mark, turned onto the runway of the airport, heading northward for a windy mile before making a turn into a tailwind onto the other side of the runway and then a sharp left along a cone-marked "exit" back to Orion Road, heading northward. 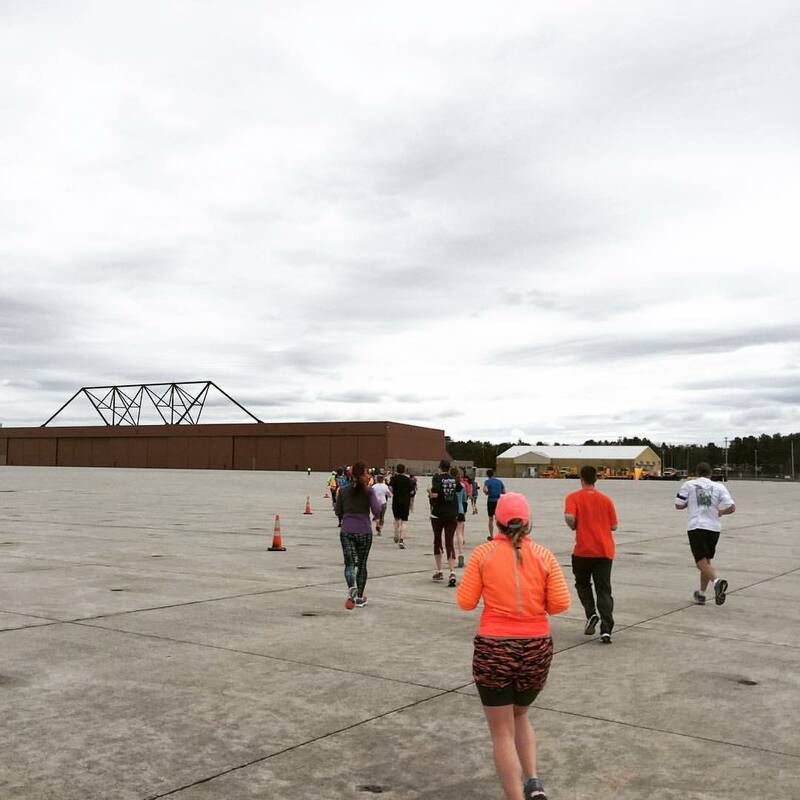 While 5k runners turned back to Neptune toward the finish, we half marathoners continued on past our 5k mark and onto Seahawk Ave where we turned right and headed out to the new FAA Airport Control Tower. 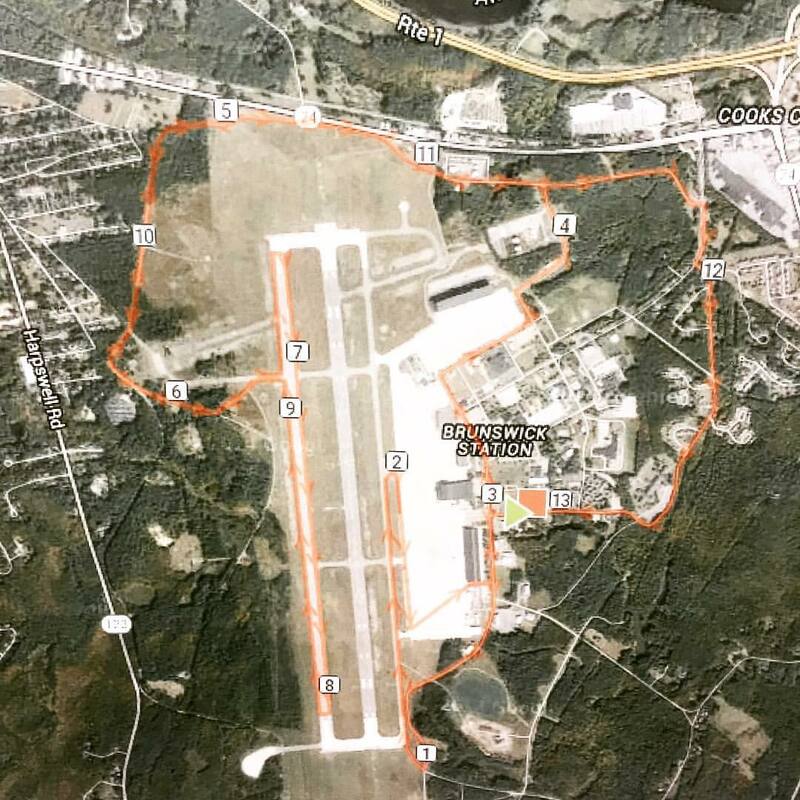 We continued onto roads surrounding the airport - Katahdin Drive, and then onto Alagash Drive, which was more of a paved pathway that went around the outside of the fenced in portion of the north end of the airport's runway - where we found some actual elevation change outside of the obviously flat portions of the course that made up the airport runway. Beyond a patch of grass as we rounded the northern boundary of the airport was an active roadway, Maine Route 24. Alagash Drive weaved in and out of woodsy areas with clearly marked signage showing that we were entering and exiting Bowdoin College owned land (which I later found out, via Instagram, was steeped in controversy due to land grants and eminent domain issues with previous owners), as we made our way to the western edge of the airport's property. Around the 5 mile mark was when the leaders of the race were making their way back to the finish line on what we realized was an out-and-back section of the course. 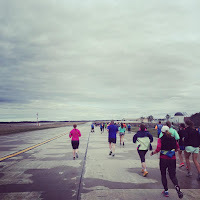 We made our way back onto the airport property at the 10k point of the course, but this time we ran on the furthest west runway, where we got on an extensive 1.5 mile out and 1.5 mile back section. The first 1.5 miles was great, with a nice tailwind pushing us along... and then we made the turn at mile 8. 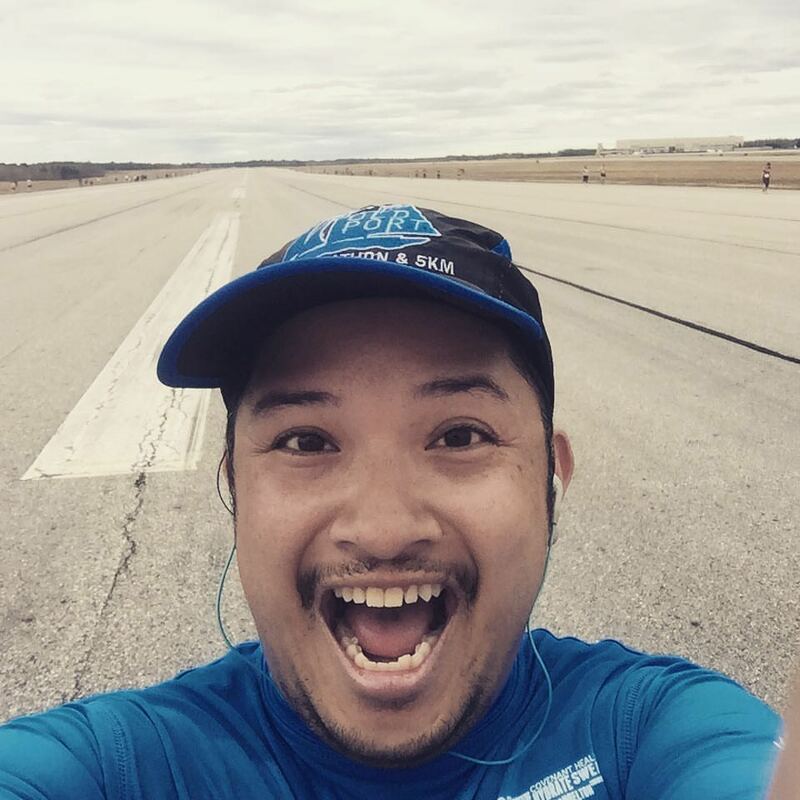 I took the phone out and recorded a video as I made my way on the turn, and then was greeted by the nastiest headwind (it had picked up SIGNIFICANTLY compared to the earlier northward section of runway) for the next 1.5 miles, slowing my pace by a good minute. We finally exited the runway for the last time just before the 9 mile mark, as we returned onto Alagash Drive but heading in the other direction for the next two miles. 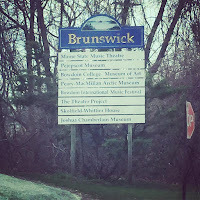 We continued down this road through a forested area, emerging onto Admiral Fitch Avenue, the entrance road into Brunswick Landing. The course cut down this section of road, passing by a Navy airplane on display, before turning left onto Forrestal Drive, a small feeder road taking us to the back end of Neptune Drive, which curved around for one final mile (and passing a retirement community) back toward the parking lot of the Recreation Center, where the finish line was located. 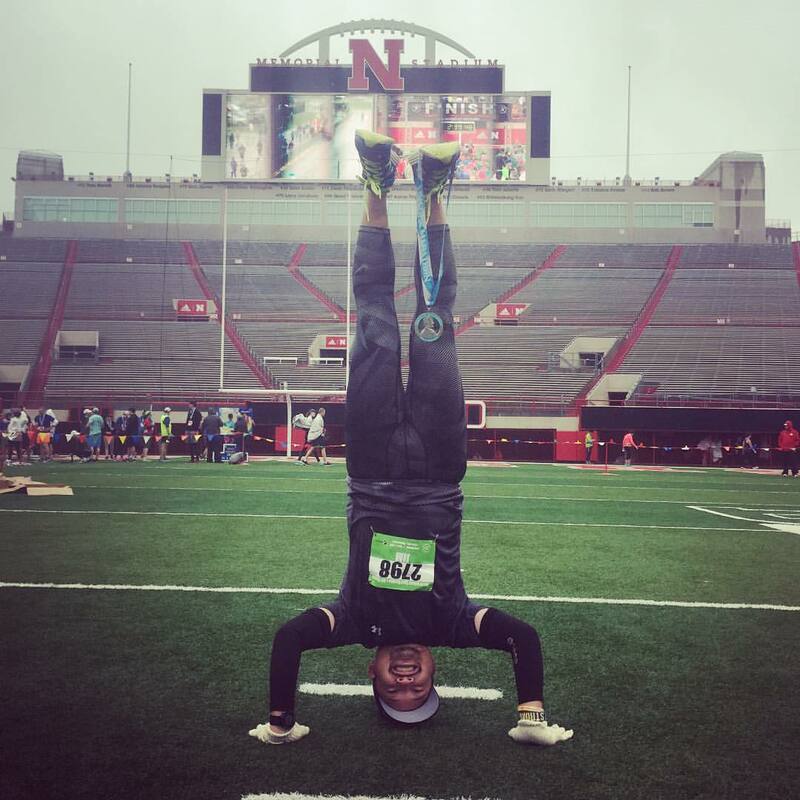 In the end, I crossed with the fastest half I had run all year - 2:09:22. The flatness of the course helped significantly, as did the tailwind at some points of the race! But I think it's actually a measure of me getting more fit and capable of going faster! 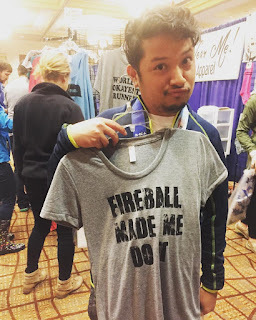 After finishing, I stuck around to wait for my friends to cross the finish line, and then Dana and I rushed back to the hotel to pack our things and shower, as per usual. 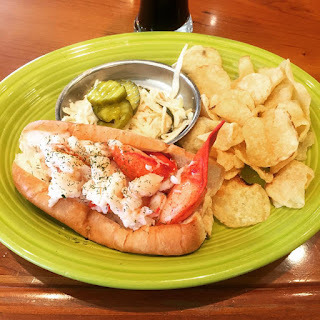 We were out the door by 1pm, and then headed off to Freeport for some much needed lunch (yay lobster rolls!) and beers! Dana had a flight that afternoon, so after lunch and some quick outerwear outlet shopping (yay Patagonia and North Face! ), she headed off while I explored more of Freeport (yay LL Bean!) 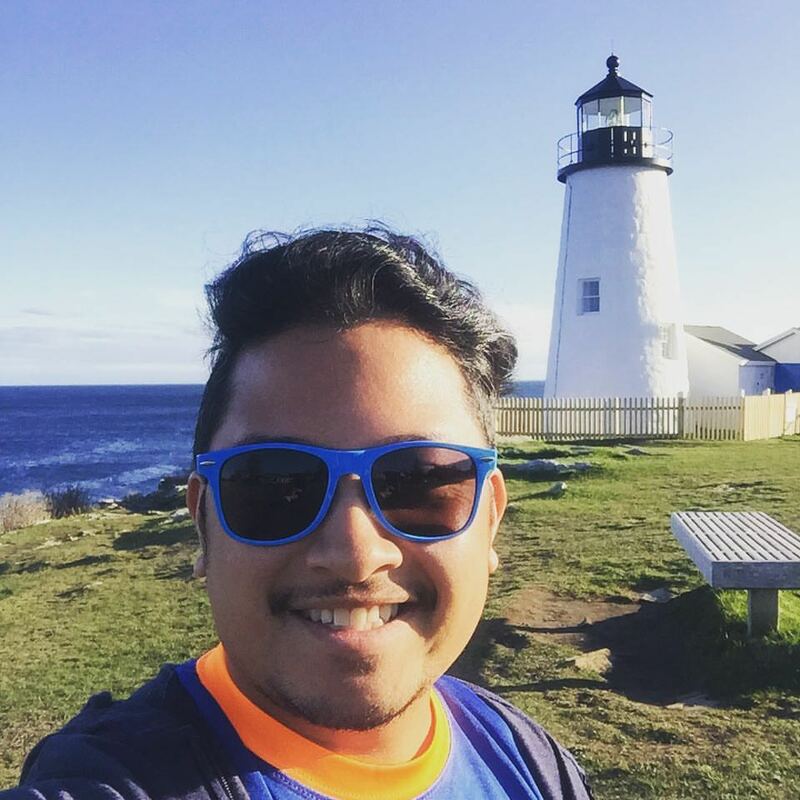 and then drove off to check out one of the most photographed lighthouses in Maine at Pemaquid Point. As night fell, I drove down to Portland to settle in to my Airbnb for the night, and got some delicious dinner at Eventide Oyster Company (a MUST go to dinner spot). I scheduled an extra day, and got to reunite with a friend who was in town doing a show at Portland Stages, visit several more lighthouses down the coast, hit up the very cold Ogunquit Beach, and even stop near the Bush family (as in Presidents George H.W. and George W.) compound in Kennebunkport. 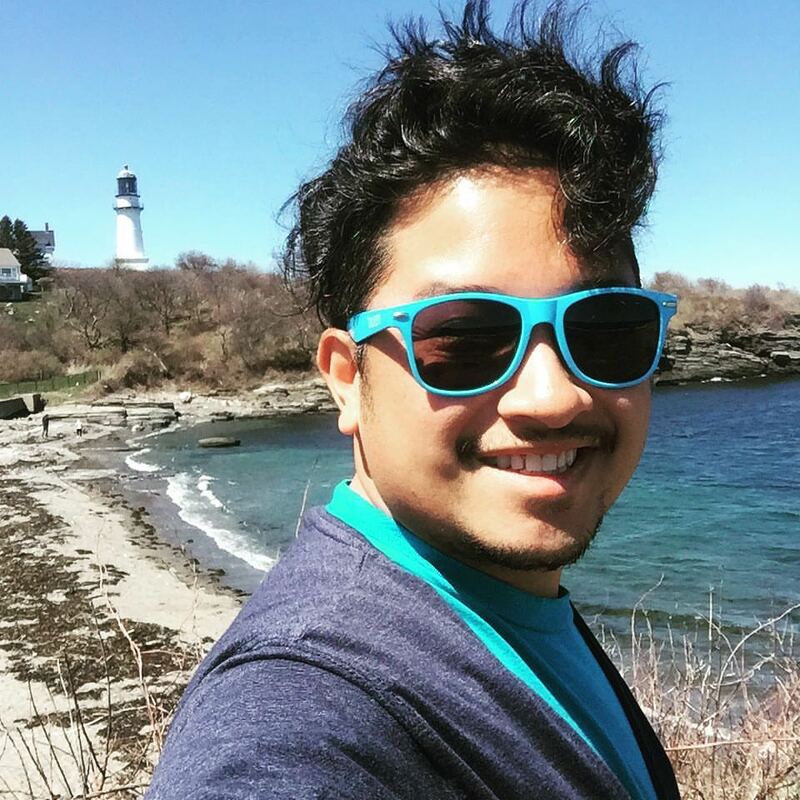 My trip came to a close as I flew back home from the quaint little Portland Jetport, and then went back to work the next day. Showing off our bling at lunch! Deliciousness, thy name is lobster roll.